With eight players in the medical department and Henrique suspended, again Scolari was forced to exercise his creative side against Atlético Goianiense at the Serra Dourada stadium, state of Goiás. The starting eleven included returning Román in defence, João Vítor on the midfield and Correa (pictured above), in his second debut in the Palmeiras jersey, on the right flank. The complete line-up: Bruno; Román, Maurício Ramos, Thiago Heleno (Leandro Amaro – 31′/2nd H) and Juninho; Correa (João Denoni – 26′/2nd H), João Vitor, Patrik and Valdivia (Obina – 13′/2nd H); Mazinho and Barcos. 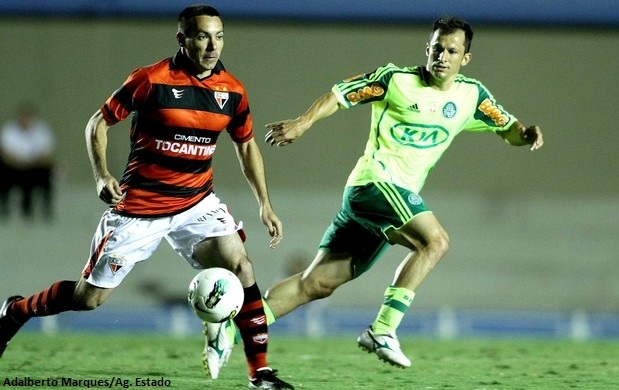 The lack of connectivity was clear, but as the game progressed so did Palmeiras’ players. Atlético however opened up the scorecard at 18 minutes in splendid fashion with the left winger Eron concluding as the surprise element. Palmeiras’ response didn’t take long: on limited space Correa worked the ball well with João Vítor, who then advanced and crossed perfectly to Barcos: 1-1 and the Pirate’s 7th goal in the Brasileirão. With 21 goals so far, Barcos is close to his self-established target for this season: 27 (the same amount he scored last season at LDU). Second half and a lukewarm sensation took over the squad. Scolari tried to inject some fuel by substituting Valdivia with Obina, but the likely scenario continued being the draw. That being said and this being Palmeiras against one of the bottom dweller (and hey, aren’t we all? ), the Verdão‘s defence took a nap as the one lousy little point went to space; the desperate blitz in the last ten minutes proved useless. The many players in the medical department is a constant problem but today’s fault was something else: lack of spark. Few players, among them Barcos, did honour the jersey today as the apathy was widespread. Let’s hope it’s gone as quickly as it came: already on Wednesday Palmeiras travel to Rio de Janeiro for the second leg of the Copa Sulamericana against Botafogo. Although the advantage is a good one (2-0 in the home game), there’s no space for farting around. The next game in the Brasileirão is against Santos at the (hallelujah) Pacaembu stadium on the 25 August. We can finally expect a good crowd in a home game. Let’s see if the bigger audience and the derby factor ignite our players to pursue those three points and remain out of the relegation zone.